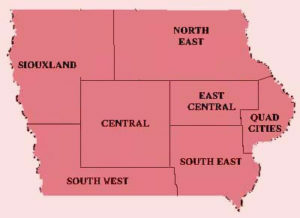 The Iowa State Federation of Square and Round Dance Clubs is composed of Local Organizations known as a Federation or Association. Each Local Organization contains area Clubs or Organizations. The clubs or organizations can be any of the following: a Square Dance Club, a Round Dance Club, a Clogging Club or the Callers/Cuer Association for that reqion. for each of the Seven Local Organizations in Iowa.